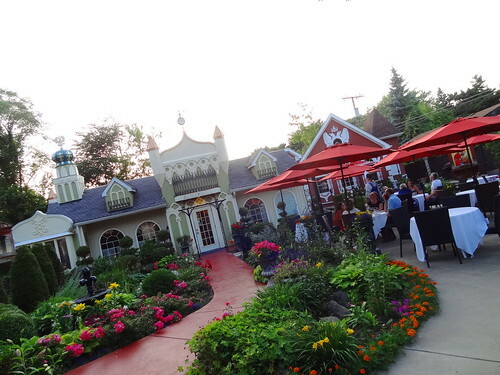 As Detroiters we work hard and we play hard; beautiful summer days are something to celebrate. Today we are doing just that. 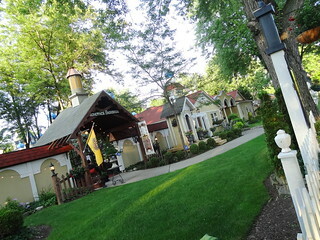 It’s Thursday, a perfect July day; the sun is hot, the sky is blue, we are meeting friends for dinner at 8pm. With plenty of time before we have to be there, we take a spin along Lakeshore Drive through the Grosse Pointes; the sunlight sparkles off turquoise water, boaters are out in numbers, we make a loop around the Lake St Clair shoreline, then duck into Grosse Pointe Park. 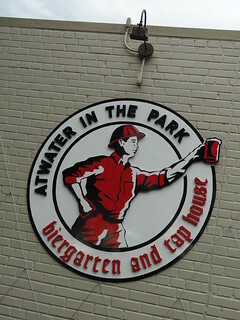 There are a lot of changes taking place on this section of Kercheval; restaurants have opened, a bakery is in the works, and then of course, there’s the new Brewery: Atwater In The Park. 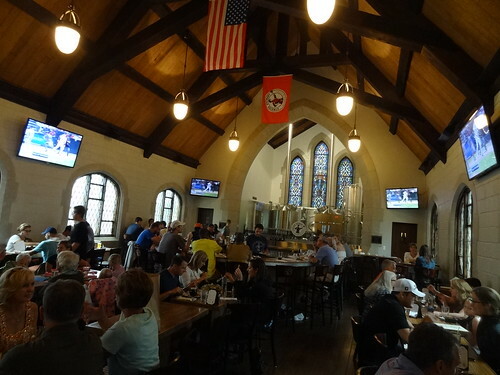 That’s right, the good folks of Atwater Brewery have converted the former Grace Community Church on the corner of Lakepointe and Kercheval into a Biergarten and Tap Room. 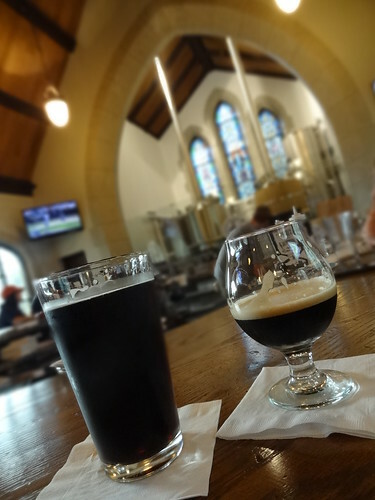 We drive through a traditional suburban neighborhood in Harper Woods, not far from Eastland Mall, turning on Old Homestead Dr we keep watch for the monastery. 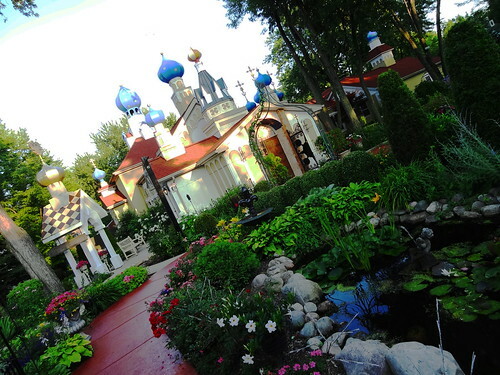 A white picket fence runs the length of the property, blue onion domes rise above surrounding rooftops, buildings have a distinct Russian flare. At the covered entryway we are greeted by a monk, following the red-colored concrete pathway, we find ourselves in one of the most charming settings around. 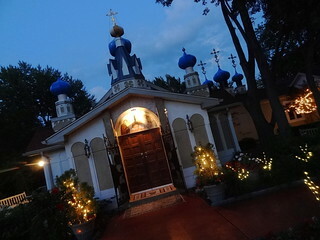 St. Sabbas Orthodox Monastery began with the purchase of a single property in 1999, a lone house that now serves as the Monastery Library and Visiting Monastic Quarters. Later that year construction began on the Monastery church, which has been added on to in stages and still has several to go. Today the monastery is situated on roughly 6 acres which include the Monastery Kathlicon, library, Abbot’s quarters, trapeza and candle making shop. 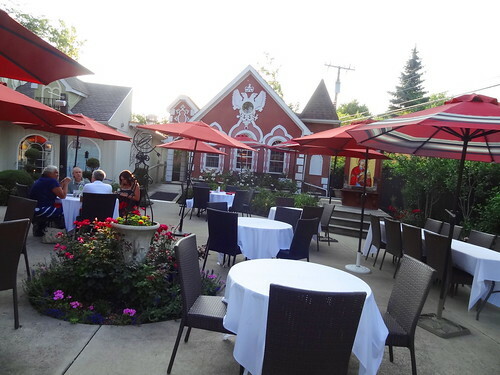 The Royal Eagle Restaurant also occupies the monastery grounds; built in the traditional Venetian Style to honor the memory and bequest of an Italian-American church patron, it serves traditional Eastern European Cuisine. Royal Eagle operates as a non-profit, all proceeds go directly toward the building and maintenance of the institution. 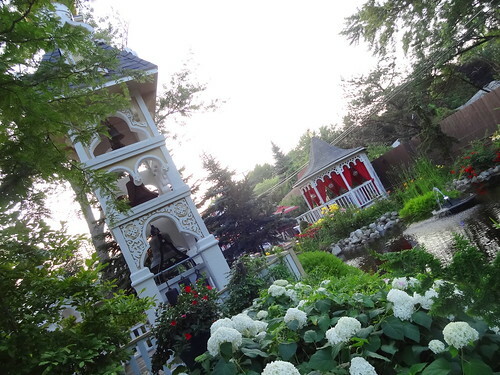 Beautiful gardens surround the monastery, fountains and mosaic shrines are tucked into the greenery replicating the style of the ancient monasteries of Jerusalem, Russia and Poland. It’s beautiful everywhere I look; flowering shrubs, petunias, lilies, purple coneflower, marigolds and hostas are blooming in beds and urns, water trickles in the distance, you would never imagine this paradise exists in the midst of a neighborhood… We requested a table on the patio, we are shown to our seats and delighted to find we are sitting by the pond with a perfect view of the gazebo and bridge; there is definitely a sense of tranquility and serenity in the air. The four of us look over the menu, it all sounds delicious; everything is prepared in house. 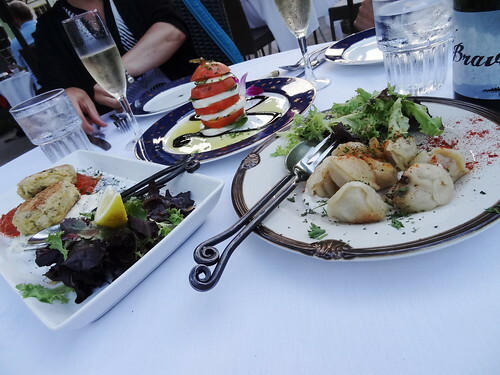 It’s impossible to pick just one thing; we order three appetizers and each of us chooses a different entree……. plates will be passed around the table. Guests are permitted to bring their own wine, so we did. We start with a sparkling white from L Mawby in Suttons Bay, our appetizers arrive, we commence to cutting them up and passing the plates; the Tower of Basil is a stack of ripe red tomatoes, alternating with fresh mozzarella and basil, drizzled with an aged balsamic vinaigrette, oh, so good! The crab cakes are meaty and delicious the lemon aioli and pomodoro sauce are perfect sides. The Siberian Pelmeni are little round dumplings stuffed with beef, veal and pork accompanied by a garlic dipping sauce, wonderful. When we are finished we open the bottle of Rioja as the rest of our meal arrives. There are four of us at the table, we have enough food for eight! 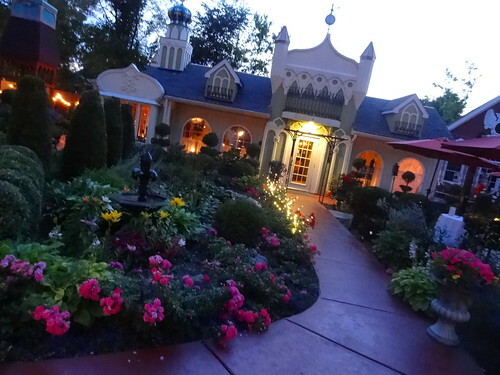 As plates arrive and glasses are filled, the sun sets, throughout the gardens tiny white lights illuminate the grounds, the glow of the gazebo reflects on the water, it is so enchanting I don’t ever want to leave. The food is magnificent, truly one of the best meals any of us have had in recent memory. 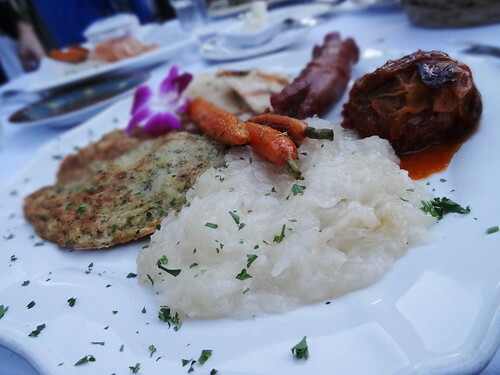 I cannot list it all, but here is a sampling of what we had: the most heavenly Chicken Paprikash with divine Eastern European style dumplings, potato pancakes, homemade sausage, barley/mushroom kasha, pirogi dumplings, salmon, and the most amazing sauerkraut ever! We ate and we drank, we shared stories, then we ate and drank some more. It seemed impossible to eat anymore, but when dessert was offered we couldn’t resist. While we waited, we wandered over to the church to get a glimpse inside. 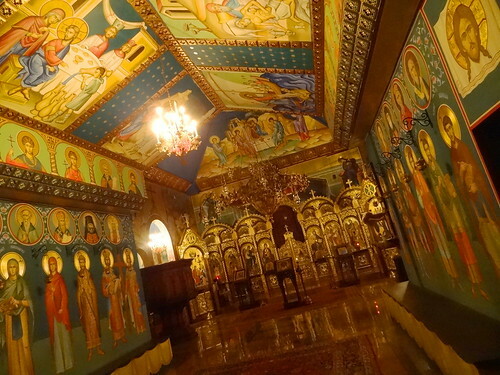 Built and beautified in original authentic iconography, over 30 icons adorn the walls and ceiling, it’s gorgeous. The gold surrounding the renderings of saints reflects off the glossy floor, they are hand-painted by a local iconographer in the strict, traditional Orthodox style; a tiny chandelier is the only source of light. 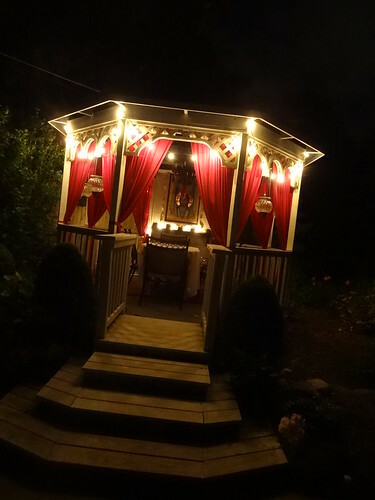 There is not another Katholicon church like it anywhere in the world. 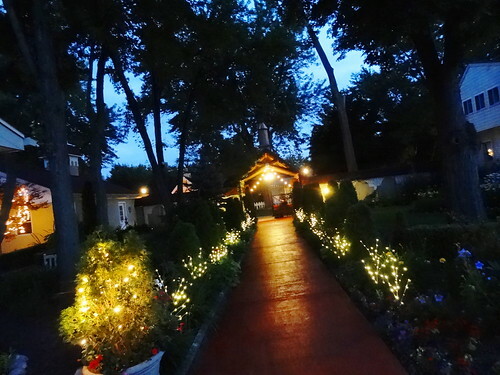 Returning to our table we notice night has fallen, strings of lights are draped across fences and over the entrance, it’s lovely. Coffee is served as dessert arrives; the yogurt cheesecake is rich and delicious, but it’s the Russian Napoleon Cake that we all go crazy for, absolutely outstanding. Talking over candlelight, somebody notices the time, it’s after 10 pm, our server who is dressed in a traditional Russian costume approaches, she couldn’t be nicer; she offers boxes for left-overs and tells us to take our time finishing up. 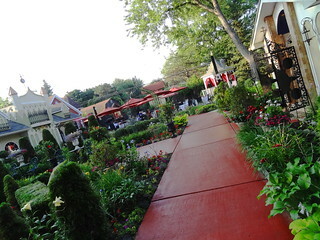 We can eat and drink no more, we are the last people left on the grounds, alas, it is time to go. We all walk out together, leaving this magical place; it is a night that will stay with us, it was an extraordinary experience shared with good friends. You’re right, everything about Royal Eagle is extraordinary.